At present, it is difficult for planes to pick up underwater sonar signals because they reflect off the water's surface and rarely break through. Planes communicate using radio signals that do not travel well in water. At present, submarines can surface to send messages - but this risks revealing their location. Sometimes, buoys are used to receive sonar signals and translate them into radio signals. "Trying to cross the air-water boundary with wireless signals has been an obstacle," said Fadel Adib, from the MIT Media Lab. The system developed at MIT uses an underwater speaker to aim sonar signals directly at the water's surface, creating tiny ripples only a few micrometres in height. These ripples can be detected by high-frequency radar above the water and decoded back into messages. The researchers tested the idea in a swimming pool and were able to successfully receive the underwater messages from above the surface. However, the system can take a long time to send a large amount of data - and it does not work when there are waves taller than 16cm (6in) in the water. "It can deal with calm days and deal with certain water disturbances. But... we need this to work on all days and all weathers," said Mr Adib. It is also a one-way system that does not let the plane send messages back to the submarine. The researchers hope to develop algorithms that can eliminate the "noise" of a wavy ocean and isolate the tiny ripples from the sonar messages. 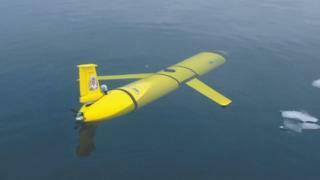 In future, it could help planes or drones detect the location of a submerged "black box" flight recorder.